Our product also contains Organic Orange (Citrus Sinensis) oil and Organic Coconut Oil for added benefits. Orange oil is a nutritional source of d-limonene and, coconut oil contains medium-chain fatty acids (MCFAs), also called medium-chain triglycerides or MCTs. Lauric acid is one of these fatty acids which is abundant in coconut oil. 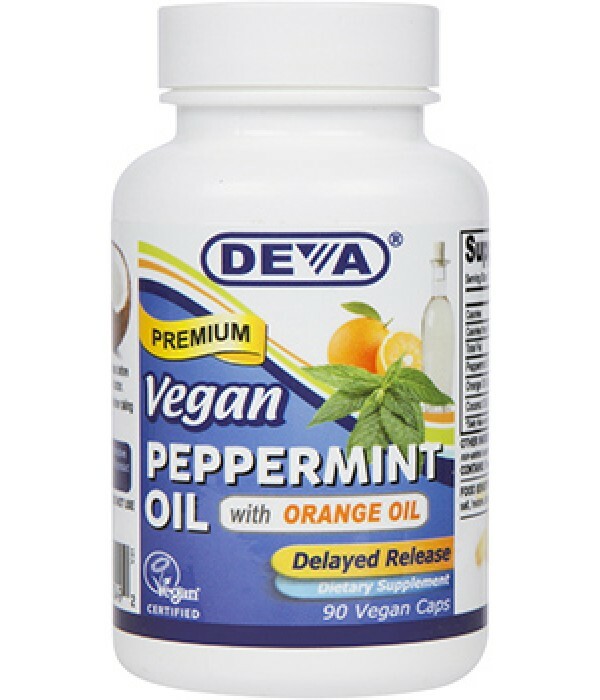 Deva Vegan Peppermint Oil product comes in vegan delayed release capsules to help reduce repeat/aftertaste issues associated with peppermint and orange oils. Our capsules do not contain any gelatin or other animal derived ingredients. 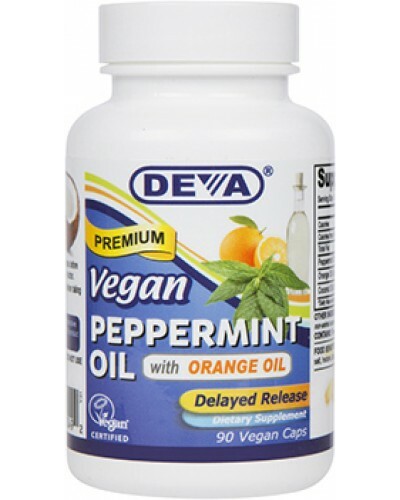 Deva Vegan Peppermint Oil is 100% animal free, and guaranteed for purity, freshness and labeled potency. Remember all DEVA Products are 100% vegan, vegetarian and are registered with the Vegan Society, the non-profit organization that actually invented the word "vegan". For adults, take one (1) capsule 20 minutes before a meal, up to three (3) times daily or as directed by a doctor. Free of yeast, wheat, gluten, soy, starch, sugar, salt, hexane, dairy, egg, fish, artificial color; animal products, byproducts or derivatives. Always consult your doctor before taking dietary supplements.